I have an illogical prejudice against spiders. I’m not sure I understand it myself. Other bugs? I can take them or leave them. As a beekeeper, I have been stung by bees on occasion. As a fisherman, especially one who spends time in Canada, I have donated a pint or two to those ! @#$% mosquito bloodsuckers. 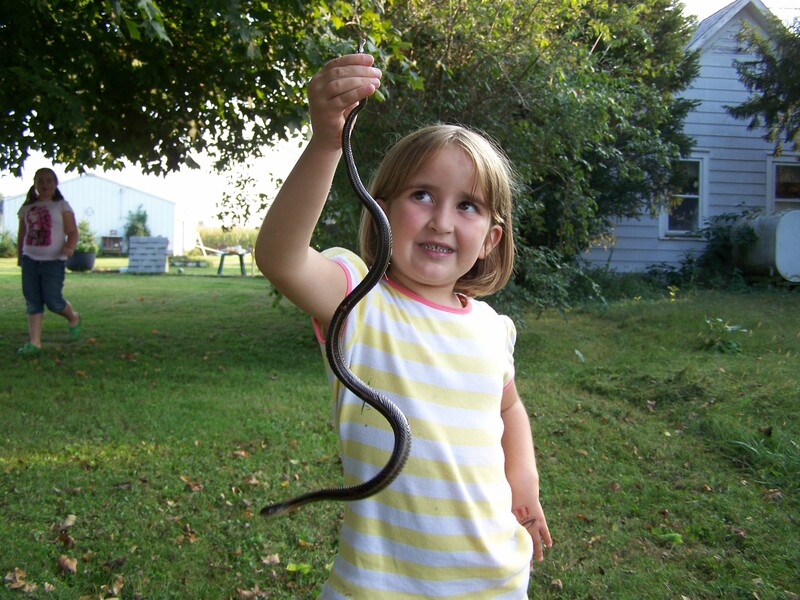 My kids and I all love snakes and it is treat for us when we spot a Milk Snake or Garter in our yard, especially if we can catch it. Centipedes, O.K., pushing the limit a bit, but I can deal with that. I even had a 5” long praying mantis land on my arm once and only levitated a few feet above the ground. But let a spider run up my leg and, much like the Roadrunner, there is a puff of smoke in the shape of me and I am gone. Most creepy crawlers don’t bother me and, indeed, some I really enjoy. 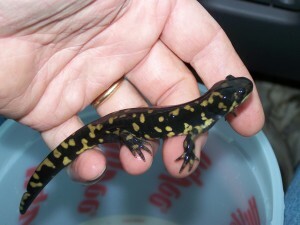 My daughter and I were elated to find a tiger salamander crossing our road one rainy day and we inconvenienced him for some time with our examinations before sending him on his way. I even walked out on my patio in Florida one morning and was excited to find a Coral Snake casually crossing our threshold. Google Coral Snake to appreciate just how momentous that was. There is something about spiders, though, that I literally can’t put my finger on. (Won’t put my finger on.) I could say “they are killers.” And they are killers, quite skillful and remorseless killers. But that cannot be the sum of it. As I said, I love snakes and they are, by definition, cold-blooded killers. 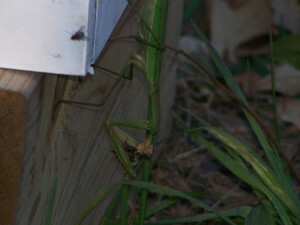 How about the mantis? These gals are such callous assassins that they make the Terminator look like Wall-E. They not only eat other insects alive, they eat their own mates alive. As a husband I just can’t sanction that sort of behavior. 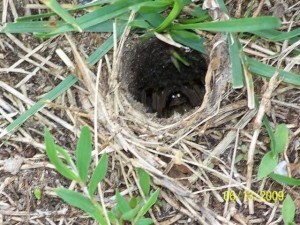 Check out photo below to see one of these ladies depopulating my bee hive one morning. She would sit up on the landing board and pluck bees right out of the air with her lightning reflexes as they approached the hive. Then she would carry them down below and chew their heads off. A real sweetie. A Killing Machine – A Large Female Mantis stealing my honey, indirectly. Of course I was kind of stealing it from them first. 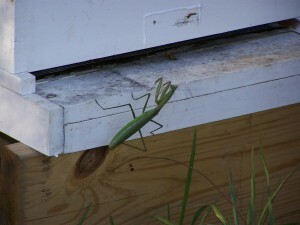 But I can appreciate the beauty and efficiency of the mantis and the snake and the peregrine falcon . These are all amazing creatures at the apex of an evolutionary pyramid millions of years old. The fact that the little brown bat darting over my head last night can weave in and out among the trees and catch mosquitos on the wing by bouncing sound waves off of them is an achievement I can hardly fathom. Spiders’ strategies are just as remarkable. I have decided that I must come to terms with these amazing hunters. Firstly, of course, so that I don’t look like a sissy every time I encounter one and secondly because they deserve our grudging respect and yes, appreciation. I have almost never been injured by a spider but the insects they dispatch have done me and my garden much personal harm. I got up early this morning while the dew was still on and took a walk around our yard. 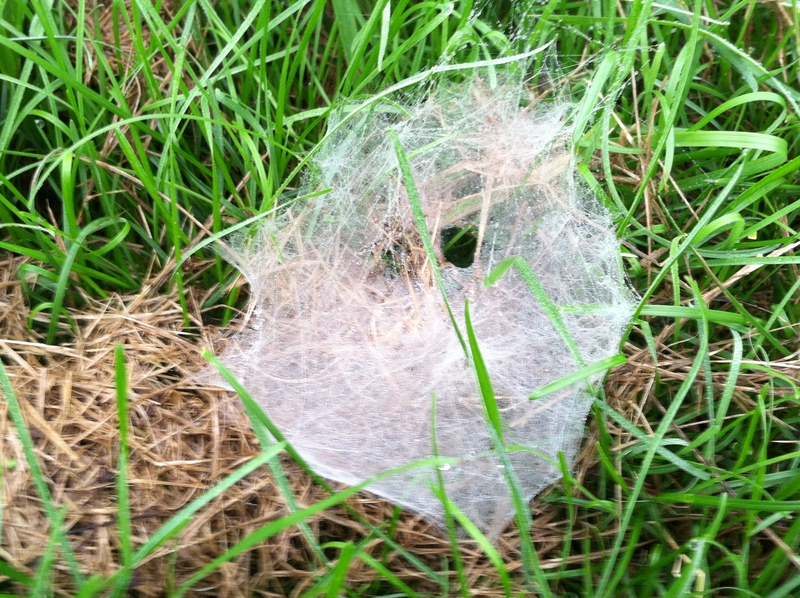 The first thing I noticed, aside from a mosquito bite, was the pattern of funnel shaped webs scattered about in the grass. I suspect they are probably there every morning during the summer months. The water droplets from the heavy dew really made them stick out today, however. The webs are the endless work of the aptly named Grass Spider or funnel web spider (Genus Agelenopsis). 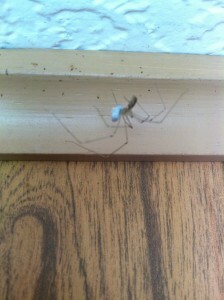 As research for this post, I decided I would try to identify all the spiders I see around our place. There is, of course, the Common House Spider (real imagination in naming that one.) The most common (by a factor of 10) spider that I see in our house, though, is a wispy, frail looking little spider that I find in our cellar anytime I want to look. They have long-thin legs, a long body, and they hang around up in the joists on disorganized, sort of drunken-looking webs, and don’t seem to do much. I went to some effort in my search, finally discovering the very cool website www.spiders.us. And I’m sure I don’t have to tell you that this long-bodied spider living in my cellar is called – The Long-Bodied Cellar Spider. Okay, back to the Grass Spider. Their little funnels are marvels of architecture and each one I saw was designed to interact with and accommodate its local geography. Each had a large platform of web, roughly horizontal and, at one end, a funnel-shaped hole disappearing down into the grass. If one looks closely he is able to see the small spider sitting down in the aperture waiting patiently. Grass Spider webs, unlike those of most species, are not sticky. They are not meant to trap the prey and hold them, but to transmit the subtle vibrations of insects which walk across them. The Grass Spider, who is incredibly fast, does the “leg work,” dashing out to grab the unfortunate victim and administer the fatal bite. There is not much about this evolutionary masterpiece to evoke our human sympathy. The famous song from the Lion King inadequately prepares us for the real “Circle of Life” and how it works. This little predator does a lot of heavy lifting for us and our instinctual response is, once again, Ewwwww! 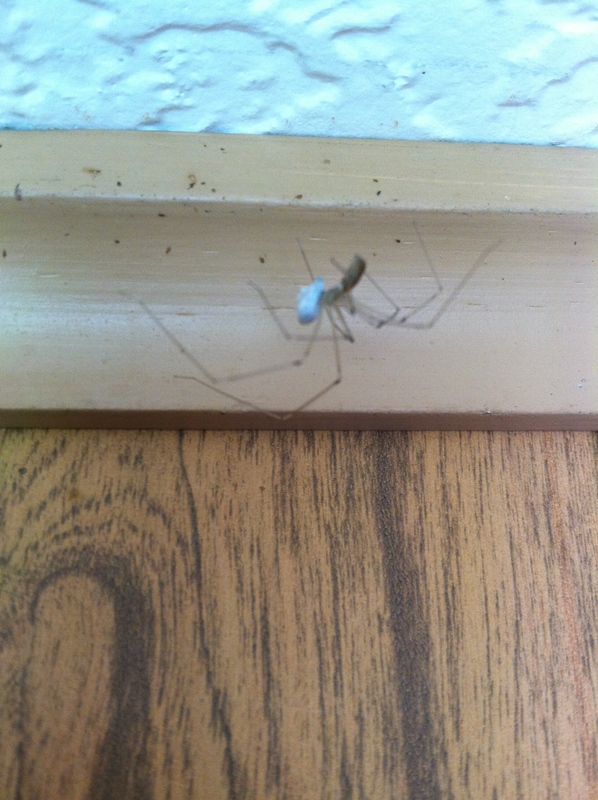 Apparently purple was outside this spider’s repertoire. 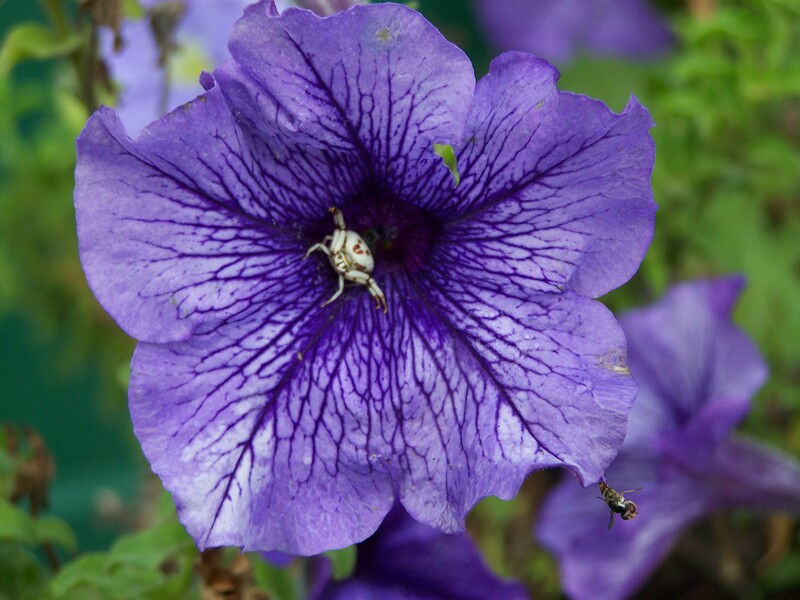 Still, he blends in pretty well here, looking very much like the stamen of the petunia. Again, a grudging admiration is in order here. Finally we have the Wolf Spider. This is probably the “scariest” spider we regularly encounter in Illinois. 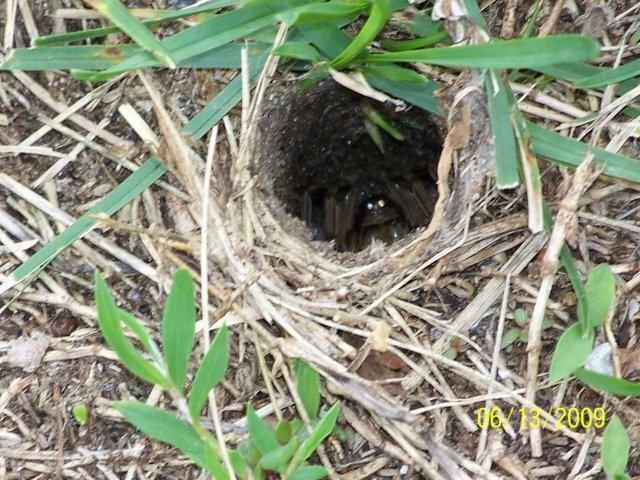 They are active “hunting” spiders who do not spin webs but, like the Grass Spiders lie in wait in a shallow hole in the ground and then pounce on any appropriately-sized prey who happens by (unnerving note: This can include small rodents.) 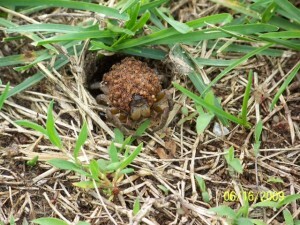 They are the quintessential “scare the crap out of you” spiders. 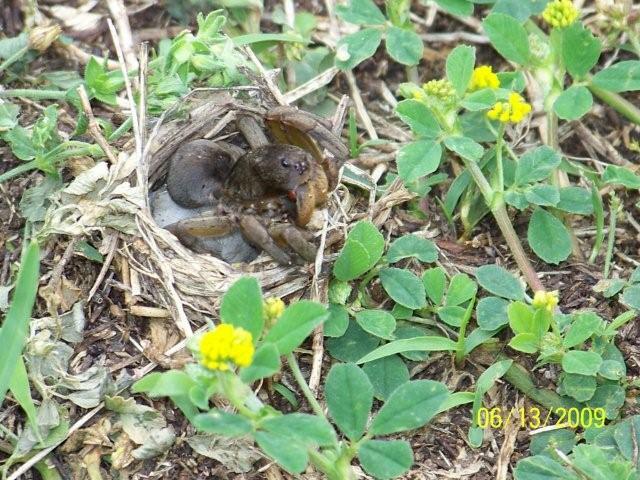 They are big and hairy and have long legs and, in one of the more creepy and odd reproductive strategies in nature, the female carries her hundreds of creepy-crawly babies around on her abdomen for a considerable time during their development. 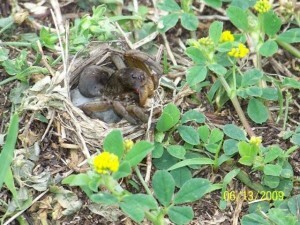 Again, below is a thousand-word photo taken by my Dad of a wolf spider in her den. Perhaps this picture illustrates the reason people fear spiders better than any other. That’s OK, I’ll come out to get you, I mean eat you , I mean meet you. Why do we, and in particular, I, get creeped out by spiders. 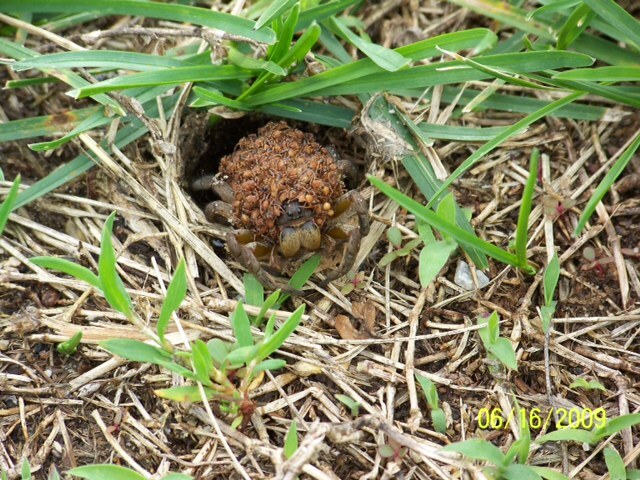 Why can I pick up a snake or handle beehive frames swarming with honeybees but will almost reflexively “squish” a wolf spider that walks across the sidewalk? I really think, in the final analysis, that it is a matter of eyes. A creature with eight legs is one thing. A creature with eight eyes is quite another. There are very few animals in the world who are not “binocular,” like ourselves. As open-minded as you might be, if this picture doesn’t give you the willies you are a better person than I am. Jellyfish, scallops, and starfish have multiple “light-sensing” organs. Some reptiles and amphibians have a remnant “third eye” which is sensitive to changes in light and dark but does not form images. But almost no other creature in nature has the obvious “creepy” grouping of six or eight eyes which are quite clearly eyes. It is hard when you are looking at them not to have a sense that they are looking at you even more intently. Many other animals bear differences from our family of bipedal, semi-hairy, semi-intelligent mammals. Frogs are different from us in every way, from metamorphosis to the simple fact of greenness. Snakes are cold-blooded killers as we mentioned before. Even our beloved cats will rip the throat out of a cute little bunny rabbit when given the chance (funny they didn’t show that in the Lion King.) I think it must be these weird, foreign eyes that prejudice us against spiders. We cannot conceive of looking at the world from eight different angles at once. Nothing on earth looks so much like our conception of an alien as a spider does. Add onto that their proclivity for killing and skulking around in dark places and they are the perfect spook. With the right point of view, we might realize that this diversity is what makes nature so interesting and worthwhile. Like with so much of nature, I think it behooves us to learn more about spiders and to try to deprogram our Ewwwww! response a bit, and make an effort to appreciate these amazing and versatile killing machines. At least keep an eye or two (or eight) on them. I do not like any spiders. You didn’t mention the brown recluse. I know someone who was bitten by one over a year ago and it still isn’t healed. Yep I hate spiders. Yeah, I’m not exactly a spider lover yet, either. I am trying. A guy I flew with a while back had a ping-pong ball sized cavity in the side of his leg from a brown recluse he shared a sleeping bag with many years ago. It made me itchy for the next few days just to see it. Interesting – in principle your concluding paragraph above is the same as your last paragraph in “A Step Forward”. Underlying fears, biases and prejudices will need to be unlearned and that’s hard work. I think you are right. I’d like to say that spiders were a brilliant metaphor I came up with to reinforce my previous essay but that might be a bit of a lie.